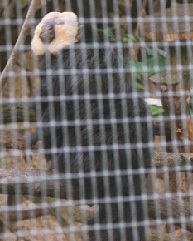 The tail of the white-faced saki is not prehensile. The facial hair color is sexually dimorphic (Kinzey, 1997). The white-faced saki has robust incisors and canines that it uses to break through the tough pericarp of fruit (Fleagle, 1988). This species is sexually dimorphic in terms of pelage color (Kinzey, 1997). 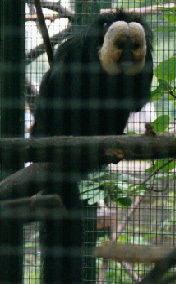 The white-faced saki is found in the countries of Brazil, French Guiana, Guyana, Suriname, and Venezuela. This species is found in secondary, ridge, savanna, and marsh forests. 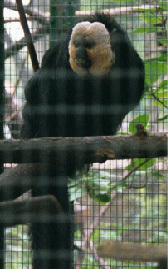 The white-faced saki is primarily frugivorous, but seeds and nuts constitute a large part of diet. This species also consumes leaves and insects, especially ants. The fruits that this species consumes have hard pericarps (Kinzey, 1992). Geophagy, the consumption of soil and minerals, has been reported for this species, most likely to supplement important minerals. The group size ranges from 2 to 5 individuals. The white-faced saki moves through the forest both quadrupedally and by leaping (Fleagle, 1988). When the white-faced saki takes off from a tree branch, most likely it does this from a vertical clinging position (Walker, 1993). When resting this species most often clings vertically to a tree trunk (Walker, 1992). The white-faced saki has a multimale-multifemale social system. Fleagle and Meldrum (1988) have suggested that this species lives in small groups that come together to form larger congregations. These groups of white-faced sakis are described as closed social units (Soini, 1986). Males do groom their young (Kinzey, 1997). Captive members of this species show low levels of intragroup aggression (Dugmore, 1986). Duetting between the male and female is important in the maintaining of territorial boundaries and maintaining the social bond between pairs which are monogamous. The white-faced saki gives birth to single offspring. Burton, Frances. 1995. The Multimedia Guide to the Non-human Primates. Prentice-Hall Canada Inc.
Dugmore, S.J. 1986. 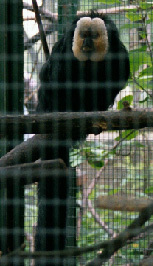 Behavioral Observations on a Pair of Captive White-faced Saki Monkeys (Pithecia pithecia). Folia Primatologica Vol. 46(2), 83-90. Fleagle, John G. 1988. Primate Adaptation and Evolution. Academic Press. Fleagle, J.G. and Meldrum, D.J. 1988. Locomotor Behavior and Skeletal Morphology of Two Sympatric Pithecine Monkeys, Pithecia pithecia and Chiropotes satanas. American Journal of Primatology Vol. 16(3), 227-249. Kinzey, W.G. 1992. Dietary and Dental Adaptations in the Pitheciinae. American Journal of Physical Anthropology Vol. 88 (2), 499-514. Kinzey, W.G. 1997. Pithecia. in New World Primates: Ecology, Evolution, and Behavior. ed. Warren G. Kinzey, Aldine de Gruyter, New York. Soini, P. 1986. A Synecological Study of a Primate Community in the Pacaya-Samiria National Reserve, Peru. Primate Conservation Vol. 7, 63-71. Walker, S.E. 1992. Positional Behavior and Habitat Use in Pitheica pithecia and Chiropotes satanas. Abstracts of the XIVth Congress of the International Primate Society, Strasbourg, France. Walker, S.E. 1993. Positional Adaptations and Ecology of the Pitheciini. Unpublished Ph.D. dissertation, City University of New York.